We are a full-service veterinary medical facility, located in downtown Nicholasville, Kentucky. Our goal is to provide the best possible medical, preventative, surgical, and dental care to area pets. 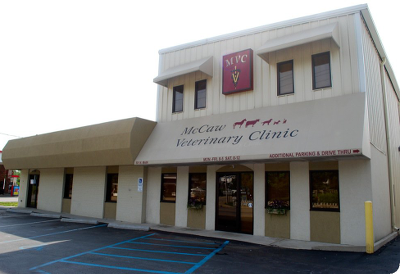 Bill McCaw, DVM began practicing in Jessamine County in 1974 and was joined by his son William McCaw, DVM in 2001. Elizabeth W. Banks, DVM joined the practice in 2007. Dr. Twehues joined the practice in 2015 to round out our 4 doctor team! We are committed to helping people in Nicholasville and surrounding areas provide their pets with the best health care possible. Please look around our website to learn more about who we are and what we have to offer you and your companion. If you have any questions, please contact us by phone or email today! We look forward to serving all of your veterinary care needs. Dental Month is Finally here!